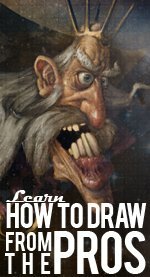 Learn How to Draw Dragons! Learning how to draw dragons is a popular choice! 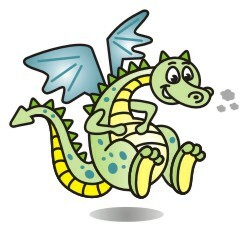 The dragon is one of the most whimsical characters, and has been pictured in many different ways. Here we'll keep our dragon as simple as possible, just adding a few little details at the end. As always remember to draw lightly so that it's easy to erase your guide lines at the end and follow the example steps as closely as you can. Draw a small circle for the head, and a larger circle below that for the "belly" of the beast. Then make an easy curve to show the back and neck line, and a backwards "s" shape for the tail line. Next, we'll "rough in" the dragon's feet with two ovals on the lower part of the belly circle. The nose is just a simple kidney bean shape, overlapping the head. Two bent lines will start the wings. Finish off this step by adding a second line for both the tail and neck as shown. Notice how these lines make the neck and tail get thicker as they get closer to the body. Our dragon is starting to take shape here and show a little character! I hope you can see that using simple shapes is an effective way to learn how to draw dragons! Let's add some details to the face - two egg shapes for the eyes, an oval for the nostrils, and a couple of simple curves for the mouth. Starting at the open end of each wing line, continue with some bumps and close the line at the body. 3 ovals will start to form the arms and hands. Connect the feet to the body with a few simple curved lines. Now close the end of the tail with a small triangle. With just some simple curves we'll add detail to the belly and tail. Some more small triangles can be added along the tail and back, and three straight lines on each wing. Add a filled circle to each eye, with a few open circles scattered over the dragon's body to give him some scales on his dragon skin. Close up the arms and use a few small circles for toes on each foot. Two more triangle shapes for "horns" on top of the dragon's head. And finally, add a few simple "puffs of smoke" near the dragon's nostrils. I hope you have enjoyed learning how to draw dragons!